On the sandy shores of the Red Sea, the five-star Titanic Palace Hotel is located to the south of Hurghada and boasts a private beach as wide as 365 metres. 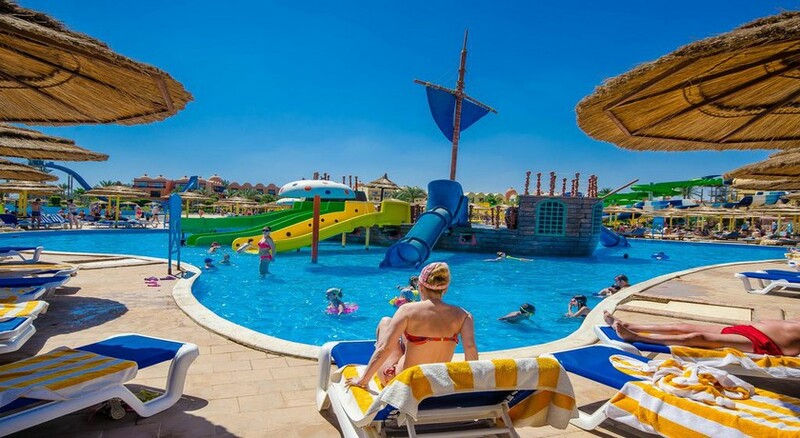 The hotel features the largest aqua park in Hurghada, with numerous water slides for kids and adults, wave pool, rafting river and kids’ pool – a perfect spot to spend a fun-filled day with your family. Relax with a tropical drink around its crystal-clear swimming pools, engage in water sports on its beautiful beach, pamper yourself with a spa session or relish delectable Egyptian cuisine at one of its many restaurants. Built in Greek style, the hotel houses spacious guestrooms spread over 3 floors that are furnished with modern amenities and are a mixture of comfort and serenity. 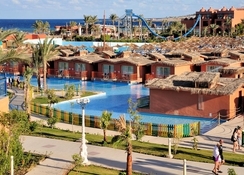 The hotel also provides a shuttle to the Hurghada city centre. Watch the waves, dip your toes in the warm turquoise waters or have a day of fun-filled adventure at the aqua park – you’ll experience luxury at its best with Egyptian hospitality at Titanic Palace Hotel. Titanic Palace Hotel is situated at the southern end of Hurghada and on the west coast of Red Sea. 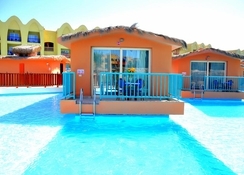 It is Just 17 km from the centre of Hurghada and 10 km from the airport. There are many tourist attractions and malls nearby. The hotel also provides free shuttle to down town Hurghada. All the air-conditioned rooms and suites of Titanic Palace Hotel are equipped with terrace, LCD TV with satellite channels, bathroom with shower, hair dryer, safe deposit box, mini bar and air conditioning. Categorised into Standard Rooms, Superior Rooms, Swim-up Rooms and Family Rooms and Bungalow Rooms, the hotel provides a delightful stay to guests travelling solo, as a couple or with family. The rooms offer garden, pool or sea view, depending on their location. The luxurious Bungalow Rooms are located in the middle of swimming pool. The hotel 6 speciality a la carte restaurants that serve delicious cuisines from around the world. These include Cleopatra and Antonio main restaurants, an Indian, a Japanese, a Mexican and a Mongolian restaurant. Guests can dine twice a week in a la carte restaurants with prior reservation, and this arrangement prevails with several restaurants of Titanic Palace Hotel’s sister hotel – Titanic Beach Hotel. there are a number of bar at the property, including Lobby bar, Pool bar, Beach bar, Waves Disco bar and Alexander bar (extra charge). Guests can relax at the private beach that offers water sports such as diving, wind surfing and snorkelling, or swim one of the 19 swimming pools, which include 3 main pools (1 heated in winter), swim up pools, private pools, kids’ pool (heated in winter) and Jacuzzi. 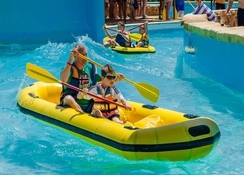 The on-site aqua park is full of thrilling rides, water slides and roller-coasters. Children can also let off steam at the playground or the kids’ club. The hotel has ample recreation activities for guests like billiard, table tennis, bowling air hockey and video games. There are day activities like water polo, pool gymnastic, darts or basketball and evening entertainment shows performed at the amphitheatre and disco, including belly dance, African show, Oriental show and lots more. ’m a little late in writing this review but I’d just like to say that me and my girlfriend thought titanic palace was absolutely brilliant! Upon arrival we were offered a swim up room at no extra cost due to it being a special surprise holiday for my partner, thank you Ahmed! You made our holiday even better! we couldn’t believe it! The service was excellent especially from zakareya 303... top lad!! Always made us feel like royalty! Constantly bringing drinks! He was always there to make us feel welcome! Food was great.. I’m a kofta kebab fan so it was right up my street! We tried all the restaurants and they were fab! Mohamed 658... top bloke! Much respect... looked after us with all the towels... we are looking to revisit next month for 2 weeks as we simply loved everything about it! We hope Ahmed will keep to his promise with the free VIP upgrade on our 2nd visit! Haha.. we give 5 STARS for us and to all the staff, keep up the brilliant work! You all were so nice and friendly, can’t wait to go back! A very nice hotel, accessible to many sights and things to do. Also very good rep! Making it easy to get around and know all the facilities that they offer. Very friendly staff and very nice hotel. Pools are amazing. From the time of our arrival we had a wow factor. The Xmas decorations the sculptures the paintings was amazing. The pools looked and were fantastic with a brilliant swim up bar. The staff were all friendly and bent over backwards to help you. The restaurants were plentiful and different choices everyday along with all the fantastic alartes esp the Japanese night. 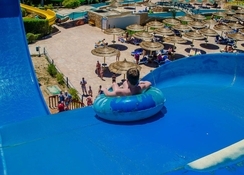 Plenty to do from the gorgeous beaches aquapark and themed activities during the day and night. Our room was fantastic with a swim up pool. Plenty of photos was taken :). Plenty of shops arrou d and we done a few trips which were brilliant esp the quad biking and visit to the bedouin village.